Only one boy was sick in my house this past week and it was little Z. 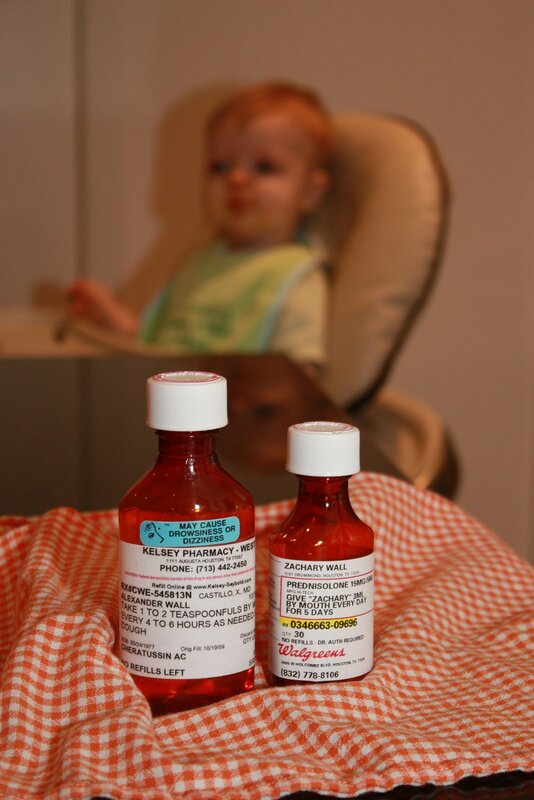 We have been through a few bouts of sickness recently, from an ear infection, to a stomach virus and now bronchitis – followed up by double ear infections again. I am just about tired of seeing my doctor and the Walgreen’s pharmacists. What struck me was the medicine that Zach’s doc gave him as a “just in case” with the bronchitis breathing treatments. It looked very, very similar to one that his father was given with his last sickness….sigh. Foreshadowing anyone? The good news is that those maladies get diluted a little as mine aren't as bad as Papa Wayne's!! You know I always had bronchitis/breathing treatments/insert other random disease here and I made it through! 🙂 Give the little munchkin a kiss for me!